Made by up and coming horror director Adam Green Frozen is a tense little tale focused on 3 main characters and happens over a couple of days. The premise is very fairly simple a trio of friends -2 boys, Kevin Zegers (Gossip Girl, Dawn of the Dead, Smallville, Wrong Turn) , Shawn Ashmore (Flash Forward, Earth: Final Conflict, X-Men, X-Men 2, Smallville) and a girl, Emma Bell (Supernatural, Dollhouse, Final Destination 5, The Walking Dead), two are a couple and two guys are best friends. The girl doesn’t really ski so it’s a novel experience while the guys are regulars on the slopes. Anyway they cook up a plan with a ski lift operator that they would be let on the slopes for a reduced non official rate. Their guy doesn’t turn up so the girl has to sweet talk another ski lift operator to reduce the fee. She manages to do this and pretty soon they are in the swing of things. However a weather alert brings their ski run to an early end. But they pressure the ski lift guy to let them go for a final run. After some discussion he relents. Our trio are about halfway up the run on the ski lift when the operator hands off to another operator, who has to leave. The trio are not aware of this when the ski lift is shut down, they are stuck 20 meters up in the air and slowly the floodlights go off one at a time. So begins their nightmare. Slowly they become aware of their situation and as it becomes colder they become more aware they have to do something if they don’t want to freeze to death. Additionally as their situation becomes more desperate the small cracks and insecurities in their relationships become crevices and tempers flare. They also have a growing pack of hungry wolves circling their feet. Their situation doesn’t seem to be precarious as say being stuck in the middle of the ocean or having a serial killer stalking you but every time I asked myself what would I do? I couldn’t find any clever solutions that they hadn’t tried, although a different order in their efforts may have helped. The story becomes tense and more gruesome as they try various things to extricate themselves from their situation. 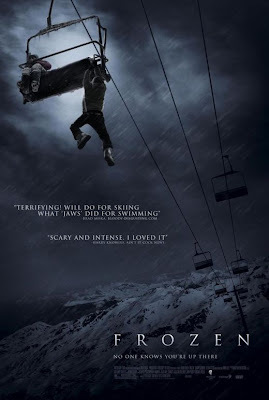 Frozen is a small film mainly shot on and around the ski lift, mainly has the 3 main leads on screen but it was good 93 minutes of tension. Frozen will be available on DVD & Blu Ray from 18 October, 2010.